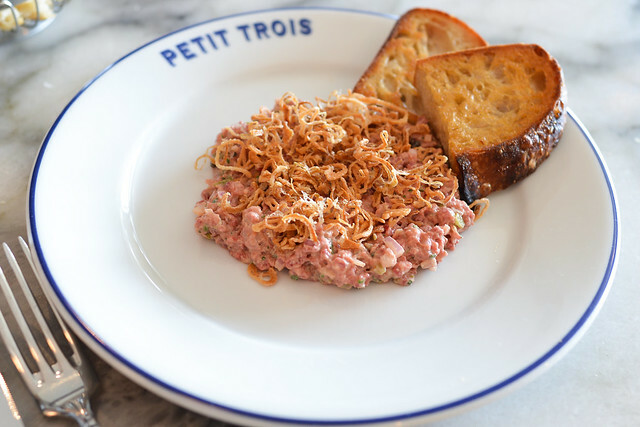 Petit Trois is Ludo Lefebvre’s latest venture, opened a few months ago as the more casual sister restaurant to the popular Trois Mec. It’s literally next door and shares a wall; I believe the kitchens/pantry are even connected. 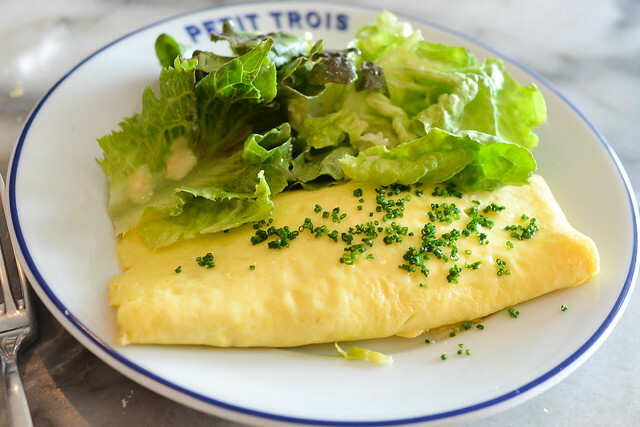 Petit Trois serves classic French bistro fare. No-tickets, no-reservations. As the name suggests, it’s a very cosy restaurant with a handful of counter seats around the small kitchen and some additional back counter seats; there are no tables. 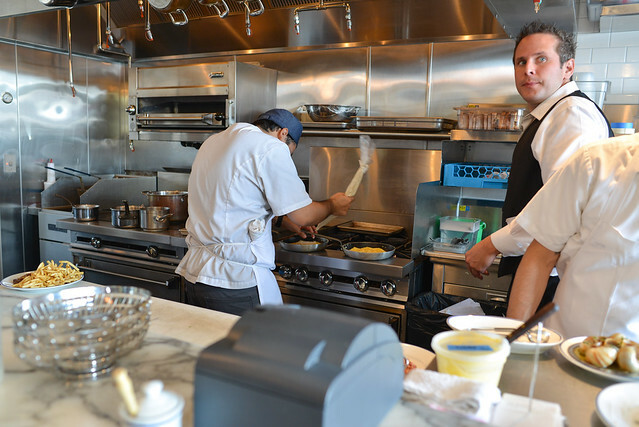 We came early for Monday lunch service and grabbed two seats at the kitchen counter with a front-row view of the action. It’s amazing how efficiently the kitchen works in such tight quarters. 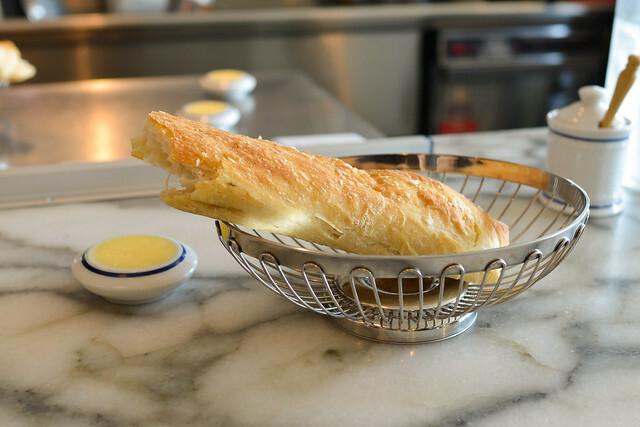 The meal began with a hot baguette which easily melted the creamy butter. Really nice bread and butter. Strong beef flavor and acidity came through on this dish; the beef was complemented by bold onions and cornichons amidst other spices. 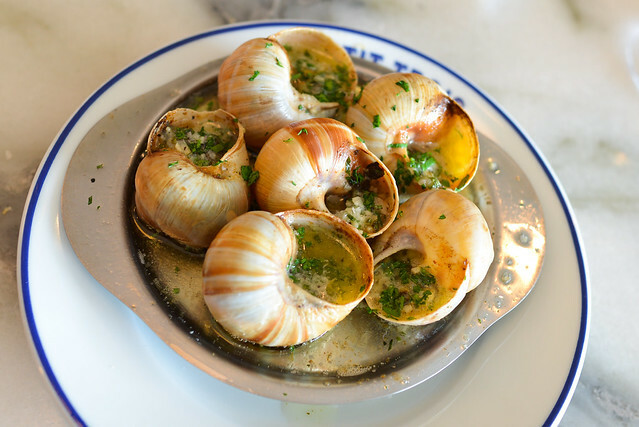 Tender chunks of snail hid in these shells, bathed with generous amounts of parsley butter. Bread was key here to soak up some of the residual butter. A rich and creamy omelette came next, aided by the oozing Boursin cheese. The omelette had a very soft, comforting mouthfeel with prevalent egg and cheese flavors. A side salad helped to balance the richness. 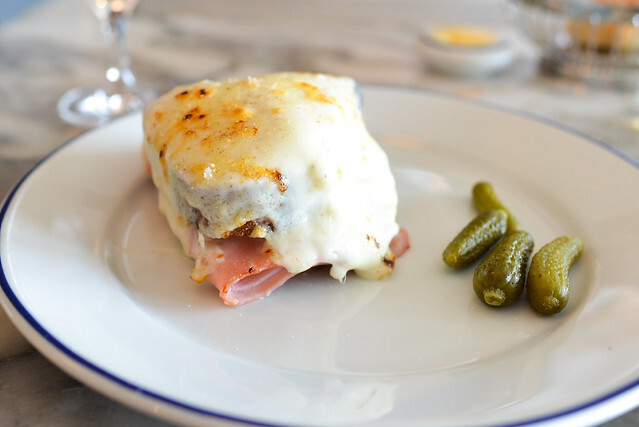 Crusty bread sandwiched thin slices of ham and was topped with a load of cheese. 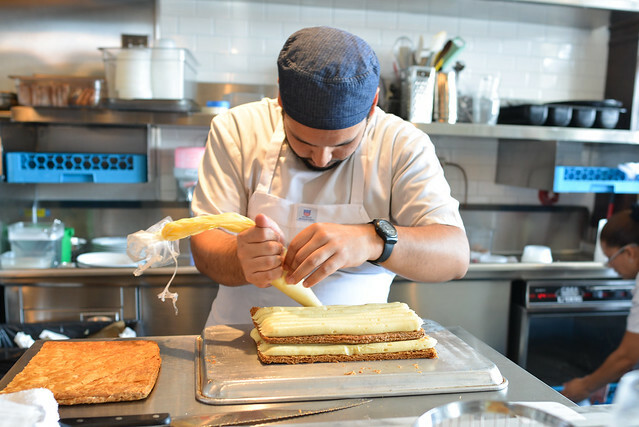 All of the promised flavors were present in this messy sandwich. We had a great view for the preparation of the last course. 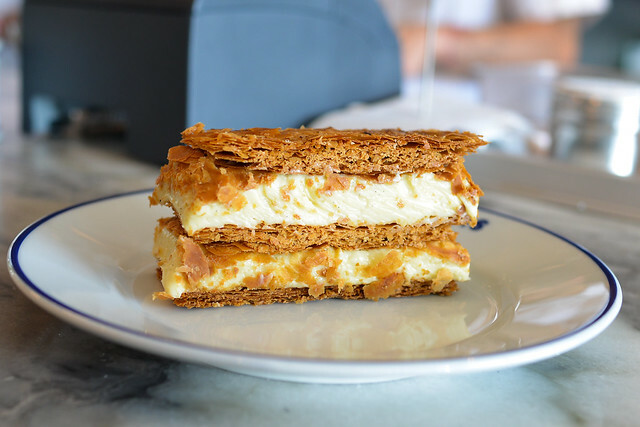 Not too sweet with some great crispy texture, I was a fan of this napoleon. 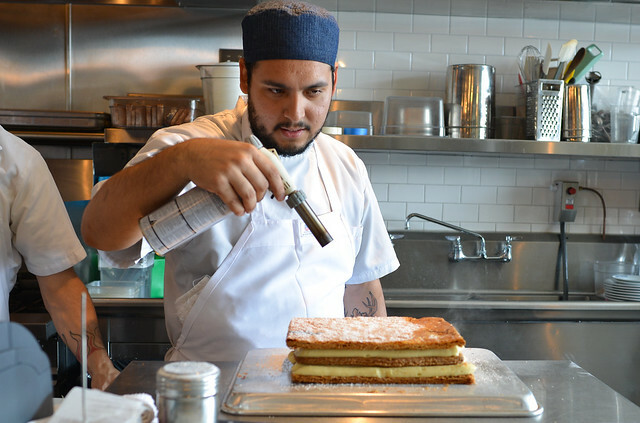 The pastry maintained its texture through each bite, while the vanilla cream provided the bulk of flavor. 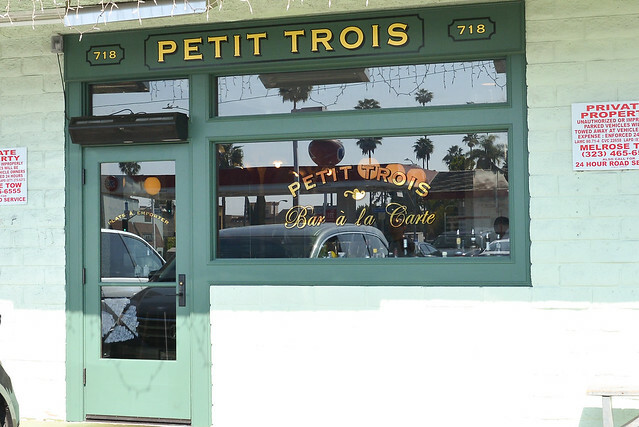 As expected, Petit Trois delivered on some French bistro classics. Nothing was particularly standout but I didn’t expect it to be – just the classics well-done. Pricing seemed to be on the high side for the simple fare, although the consistent crowds appear to suggest otherwise. i thought you were gonna do a review for gordon ramsay. are you going to?